A great deal of pride and enjoyment comes with owning a gorgeous classic car. Whether you own just one or several, you know how important it is to protect your investment. Classic cars are not those that we see parked on the street in front of a house, or even in the driveway under a tarp. These vehicles are prized, like beautiful pieces of art. They should be protected from the elements that could damage their pristine condition. One of the considerations to be made when adding a classic car to the family is how this vehicle will be stored. Garage storage may seem the most sensible option, but this does not mean it is the best. A garage does not necessarily contain the amount of open space storage needed for your classic cars. 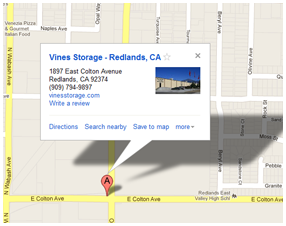 What you may lack at home, however, can be found at Vines Storage in Redlands. Garages are fine for parking your everyday vehicle. Our garages also tend to hold unused seasonal items, sporting equipment, sometimes our laundry appliances, and more. When you store your classic car, you want to ensure that no boxes will fall on the hood or roof, or against the side of the vehicle, possibly scratching the paint. Vines Storage features a redesigned warehouse building with high ceilings and ample space for driving vehicles in and out safely and conveniently. Although we offer a variety of storage options, including outdoor storage spaces, our indoor facility is top of the line, just what you want for your classic cars. Indoor storage is only one consideration for your classic car. Security is another. Safekeeping is yet another reason why classic car owners choose not to keep their vehicles at home. By keeping your vehicle in a storage facility, you never have to worry about who may see you drive your valuable car in and out of your garage. You also don’t have to worry about your home becoming a target for robbery. At Vines Storage, valuables are protected within a secured building situated behind tall walls. Our entire property is also monitored with 24-hour surveillance every day. Protect your valuable classic cars with a flexible leasing package from Vines Storage. Contact us at (909)389-6209 to learn more about our storage solutions.